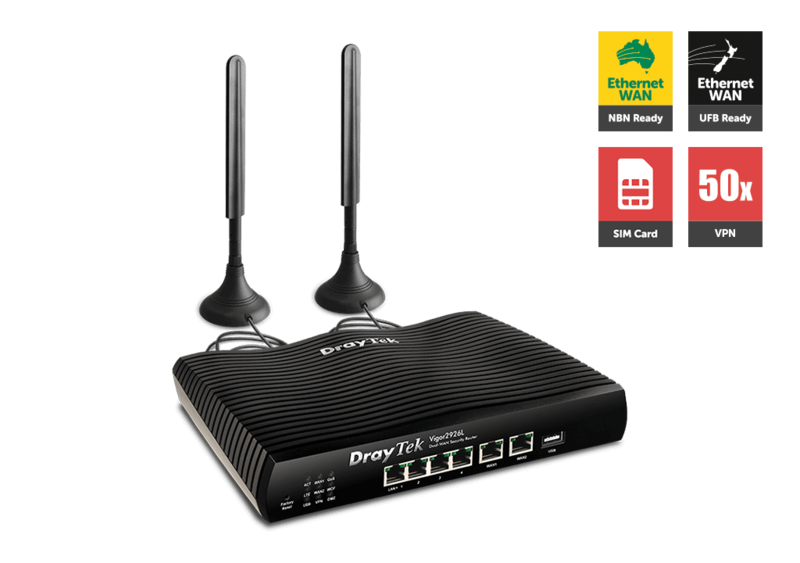 Draytek’s Vigor2862 series is a business-focused range of routers that really focuses on network management and control, alongside robust redundancy. There’s a range of different models that add or omit certain features to best suit your particular environment and installation. For this review we tested the Vigor2862Lac, which is the top spec model with built in 4G/LTE connectivity. As we mentioned above, the Vigor2862Lac is the top-specced model in the series, meaning it has the most features – however that doesn’t mean it has all of them, and other models in the range do include certain features that aren’t found here. It’s therefore a good idea to take a look at the entire series and see which model best suits your specific requirements. 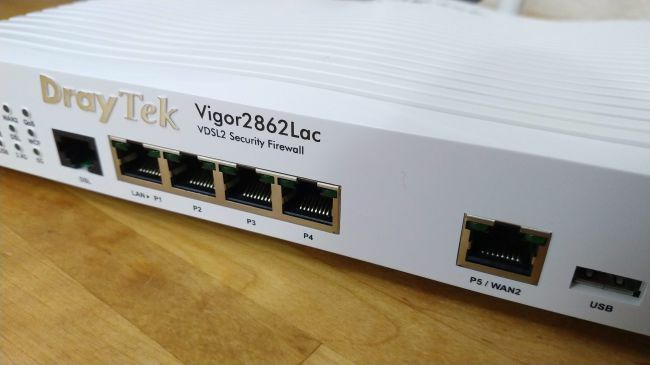 The Vigor2862Lac is built around four Gigabit LAN ports, as well as 4×4 MU-MIMO 802.11ac spec Wi-Fi, with four removable antennas on the rear. 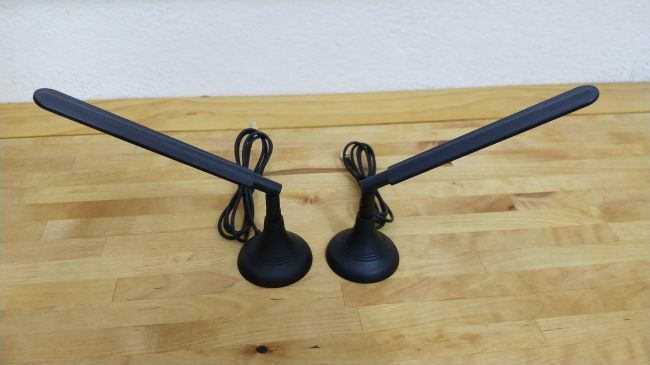 Wireless bandwidth is up to 1,733 Mbps, and can operate as a bridge or a Wi-Fi repeater. This means you can use the Wi-Fi like a WAN port, and connect into an existing network and share the connection. 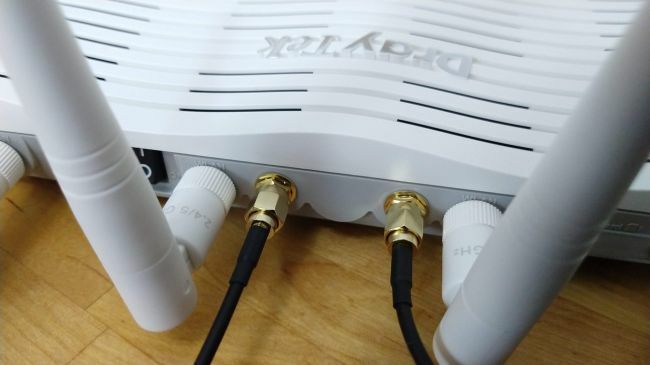 The 2862Lac’s cellular modem provides a Category 4 4G/LTE connection, which means it can support a maximum of 150 Mbps downstream and 50 Mbps upstream. Those maximum speeds will depend on a huge number of external factors, however, such as reception, number of other users on the tower, and even the weather. The 2862Lac can handle all the current Australian 4G frequencies, so will happily work with any local service provider. (The only slight exception to this is band 42 (3500MHz) which is currently undergoing testing for fixed wireless connection, and due to be available in 2019.) The router can also be used to send and receive SMS alerts, and even report its status via SMS. 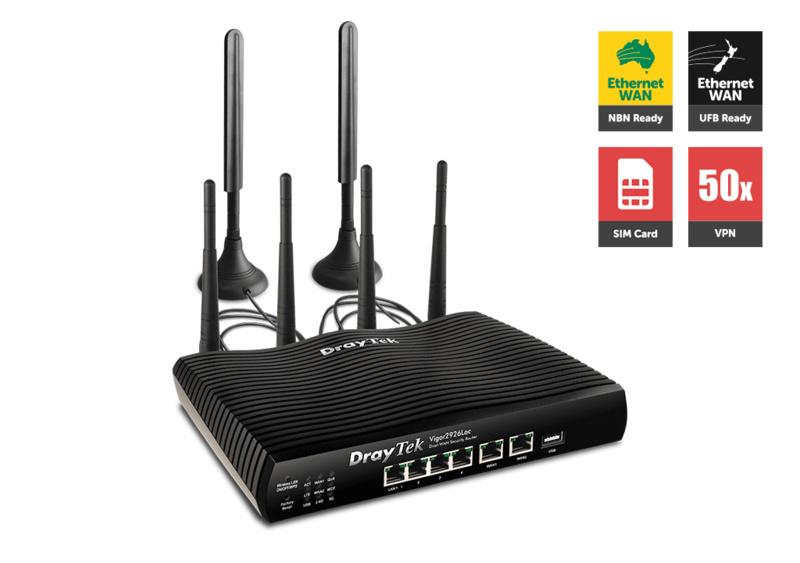 Out of the box, the router needs the antennas connected, power plugged in, and to be connected to a local network or WAN. Inserting a SIM card requires removing two screws and a cover, and it’s worth noting that it needs an old school full size card, not the micro or nano sizes typically used in today’s phones. That shouldn’t pose too much of an issue though, as most providers will send a SIM in pop-out sections that include the full size. It is a bit of a pain if you are wanting to use a SIM card removed from a phone, but a SIM adaptor is only a few dollars online on eBay or any almost any phone-accessories store. Configuration is performed via the typical web-browser interface, which at first glance should be quite familiar to anyone that’s set up a router before. At second glance and after a bit of exploring, it’s a bit more intimidating. At third glance, you’ll realise that most of the tricky functionality has wizards that will walk you through the setup. It’s still not simple, but DrayTek has a large number of how-to articles that can help bridge any knowledge gap, all available on their website support pages. You can search the pages for a particular issue as well, and they cover everything from the basics through to complex features. DrayTek also has email support available if you become truly stuck somewhere. 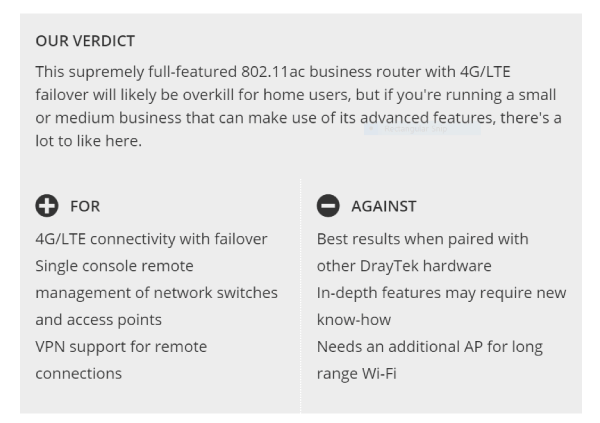 It may look like a fairly standard wireless router, but the Vigor2926 hides a wealth of business-focused features. For remote access such as employees working from home, the router can handle 32 VPN tunnels – 16 of which can be SSL-VPN tunnels. There’s also a comprehensive firewall, which can filter content and IPs, help prevent DoS attacks and more. In other words, the Vigor2862 is well equipped to manage a range of business setups – from ones where everything’s set up in a single location, to networking environments spread between multiple sites. It’s also ideal for a business who wants a small network now, but the option to expand in the future without having to learn to use new equipment. 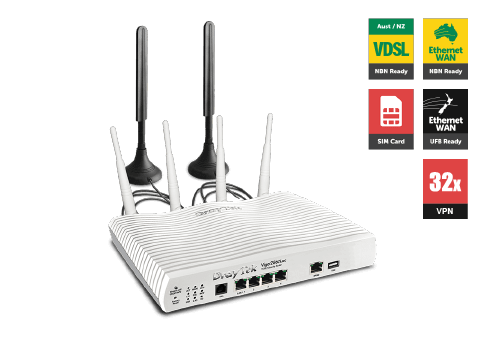 The Vigor2862Lac’s WAN port can be reassigned to operate as a standard Gigabit LAN socket if you don’t need WAN functionality. 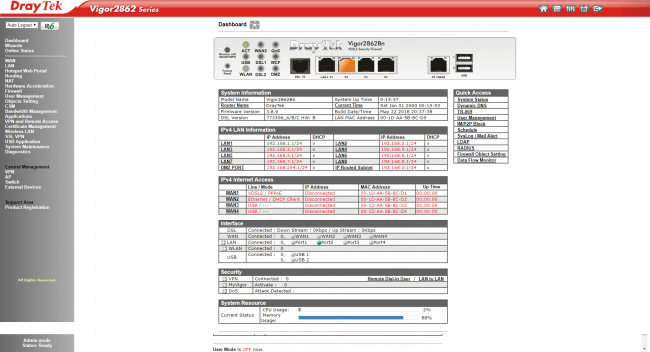 We tested the wireless network using a Netgear A6200 USB Wi-Fi dongle, rated for 867Mbps on the 5GHz band. Keep in mind that the ultimate wireless speeds you’re able to achieve will depend on the client devices and antennas used. While the Vigor2862Lac has plenty of support available, it’s geared towards those who already have some networking knowledge. It has loads of business focused features that allow plenty of flexibility and expansion in the future.